This tiny, tiny apartment on Sydney’s Taylor Square uses everything it’s got to make an impact. At 34 square metres, position is everything. Right on Taylor Square, the studio is light-filled and while there is more of a vista out towards Bondi than a view, the studio’s large façade windows provide full engagement with the bustle of the intersection. It’s the perfect spot for a pied-à-terre. 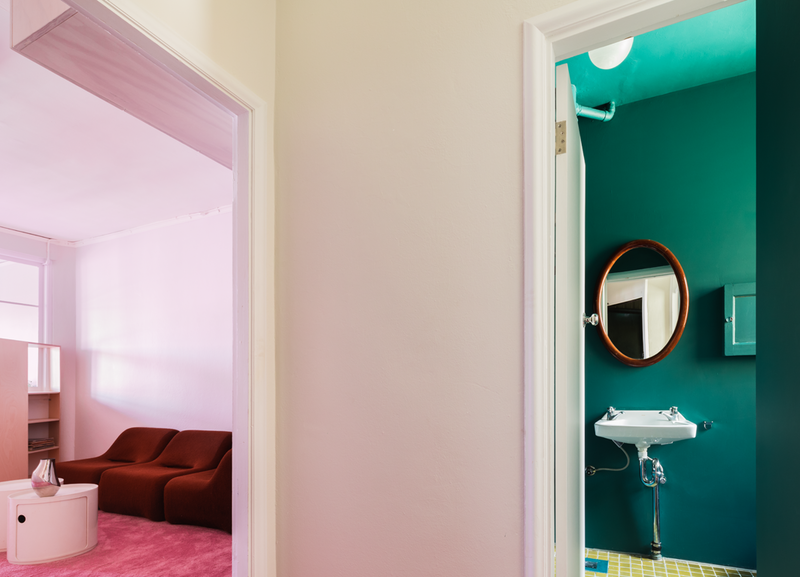 Fully embracing place, the apartment has an intimate relationship with the dazzling hot pink artwork of Reko Rennie’s Always Was, Always Will Be. The signature landmark of the area the building’s circular form is decorated with a geometric line pattern of blue and black on a pink ground with the work’s title running around the circumference in hot pink neon. 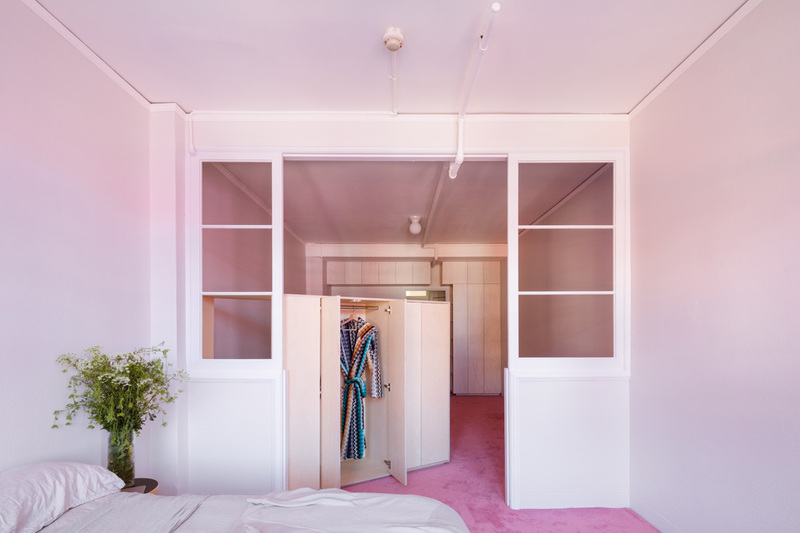 At roughly 2 pm each afternoon, the condition of the light shifts to reflect the predominantly pink building straight into the apartment, flooding it with pink light. Catseye Bay’s response has been to extrapolate the ephemeral element of the artwork to full advantage. “The pink splashed through the apartment,” says Catseye Bay director Sarah Jamieson. “I realised it was particular from the pink and blue of the artwork, so it was a specific pink at a specific moment between two and four. Working with pink further was to draw attention to it and make it more special: to be more fully in the pink.” As such, while the walls look pink, they are actually white (Murobond). 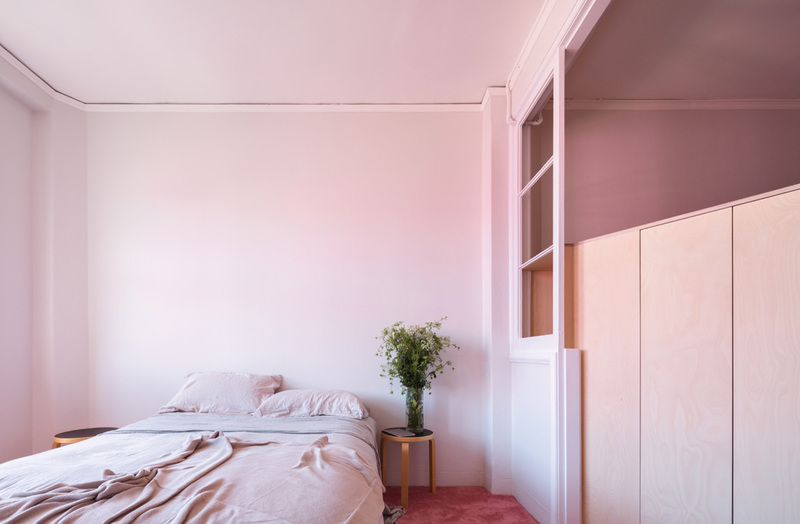 Conversely, the carpet (Carpeteria Satin 3862) is deliberately a warm rose pink to exaggerate the effect and continue the pink after the transient effect. 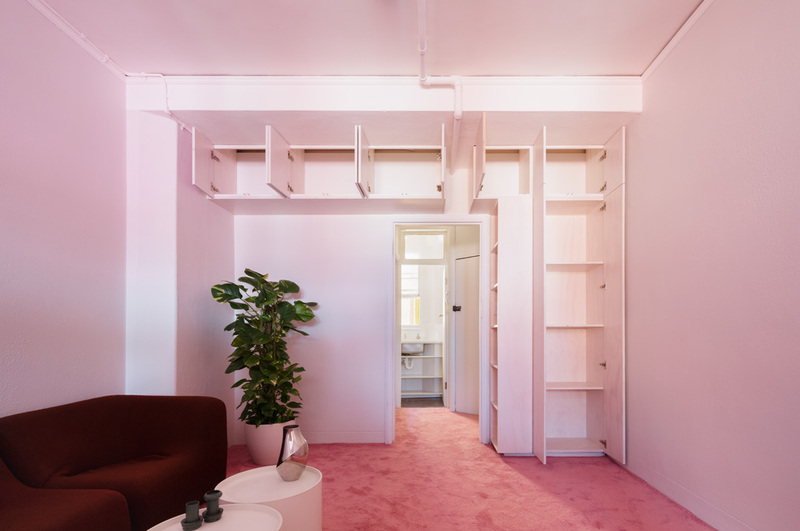 “The carpet bounces the pink light to the ceiling and the whole space goes pink and warm, then settles down as the sun moves to another position and the indirect light softens everything,” adds Jamieson. With a budget as small as the apartment, the list of materials is shorter than 10 items and this is including the bespoke robe, which took 60 percent of the budget. Built as a stand-alone crafted object, the birch ply divide (Matthew Canning) is the single embellishment in the living area. Small and carefully placed to optimise living and bedroom to either side, the robe went through a long location process with a hanging screen moved and tweaked until the ideal location was realised. 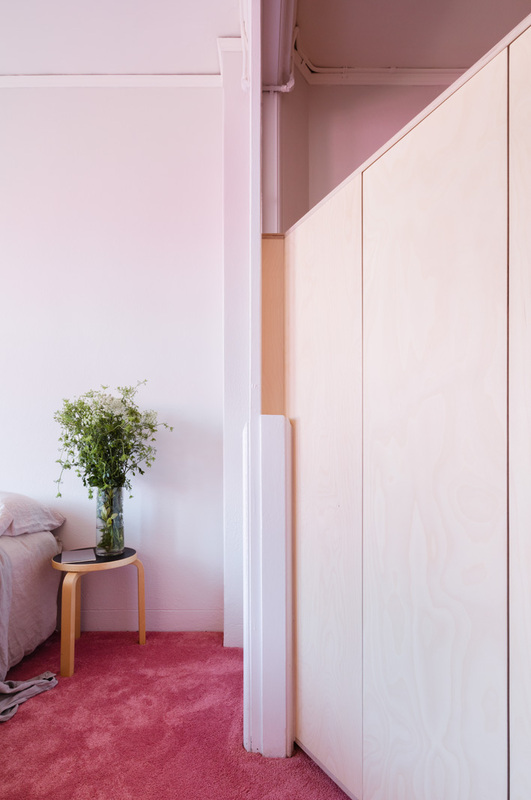 “I really wanted to take a tiny space that didn’t [previously] attend to the nuances of how you live life, that division of where you sleep or sit on the lounge [and prompt] a spatial question of how you bring that attention to a 34-square metre apartment,” says Jamieson. Effectively, the result creates a gesture of separation to create a living/bedroom divide without interfering with light and flow. 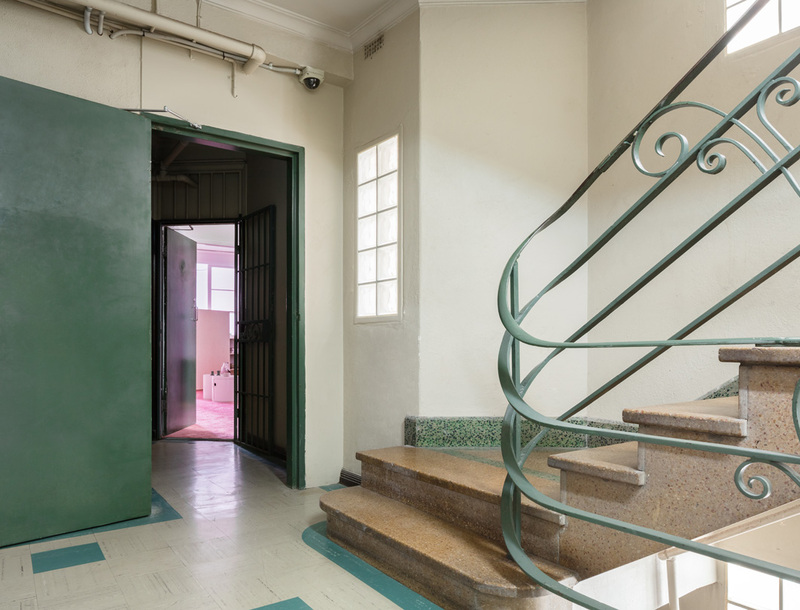 Picking up on the antique eau de nil of the building’s steel balustrade and forest green of linoleum details, green has been exploded into the apartment beautifully. “We tested greens for the bathing experience and tied it back to the original building. I wanted the space to envelop; now it feels deep in relation to the overall space,” explains Jamieson. Almost an indulgence with a wall of deep emerald gloss tiles (Amber) and emerald walls (Murobond), the bathroom creates a strong contrast to the otherwise pale interior. It is also exceedingly simple with era-true taps and a free-standing sink, tiny cabinet and op shop mirror. “I was interested in intensifying things, rather than taking the space in a different direction. The selection of the taps was made at the time the building was built – to not change them was a continuation of that aesthetic,” says Jamieson, who chose the apartment for its heritage. “Lovely art deco details were evident in cornices, the frame used to divide space, high ceilings and light coming in,” she says. Lighting from Bunnings and IKEA meet the basic necessities without adding extra stuff. And, for this apartment, that’s what it’s all about. The kitchen is ridiculously small, but Catseye Bay hasn’t fought it. Rather, as Jamieson points out, “It’s too small for a kitchen, but if you think of it as a cupboard to cook in, it is quite generous.” Additionally, with room for two burners, a full-sized sink and bar fridge, the solution of making it a large cupboard means the whole can disappear. Dressed to reference a Neapolitan ice-cream, the furnishings are simple and neatly in keeping with the apartment as a pied-à-terre. There’s a Featherston modular lounge in chocolate, Kartell storage as coffee tables and Artek stools as side tables. This is a studio for simple living and just as it should be.